Although by training a doctor – an exact profession – Dadja Altenburg-Kohl has spent her entire life in the thrall of the muses. Her passion for art is far from Platonic – she performs on stage at the National Theatre Ballet and has embodied her love for art in the Museum Montanelli, which she opened on Prague’s Neruda Street in 2009. Originally, the museum was intended as a place to exhibit her private collections, but the museum’s portfolio is much broader today. Altenburg-Kohl uses the museum to present her original curatorial projects, which are less exhibitions in the traditional sense and more like comprehensive sensory experiences presenting often surprising associations. Do you recall under what circumstances you bought your first painting? I remember it exactly! It was a few months after I had emigrated to Germany – at an exhibit opening in Frankfurt, where I used the first earning from my first job to buy my first drawing for my first home. I still have it. At the time, Germany was home to geniuses such as A. R. Penck, Georg Baselitz, and Markus Lüpertz. I was absolutely enchanted by their existential paintings. I couldn’t afford to buy any of their works, but my fascination with such magnificent painting has remained with me ever since. How would you describe the scope of your collection? My collection is diverse and emotional. There isn’t any system or logic to it. It consists of items from the Romanesque period all the way to the present day, including some absolutely crazy videos. But I am just as easily excited by a little item I might discover somewhere in a junk shop. If it reflects my current mood or thoughts, it can captivate me just as much as a work of art. When I began to visit the Czech Republic again after the revolution, I wanted to catch up with that period when, despite the totalitarian society, our country was home to some truly great artists. And so I met Adriena Šimotová, Běla Kolářová, Hugo Demartini, Jitka Válová, Bedřich Dlouhý and many others whose works make up part of my collection’s Czech section. Have your tastes evolved over the years? My tastes are constantly evolving, and I hope that they will continue to do so! After a period in which I only recognized a very economical artistic style, I have again begun to appreciate a certain opulence in art. I have also acquired the courage to combine seemingly incompatible styles and tendencies and to place them into new constellations. This is the main reason why I decided to establish my own museum where I can freely realize my ideas. I enjoy finding associations where nobody suspects them, and I try to present these unexpected relationships to my visitors. But the museum isn’t just my private territory – I am open to collaborating with other curators from whom I can learn. The exhibitions that you put together bear a distinctive signature style. For instance, for the current exhibit by Pavel Roučka, you have taken an unusual approach by combining his abstract paintings with objects from Christian art. I have long and intimate relationships with many artists, so in my mind their art is intertwined with their life stories. In this case, I have tried to reveal the mystery of Pavel’s inspiration and to explore the impulses behind his creativity, to penetrate what we might call his artistic soul. To this end, I have used various artifacts from our collection that engage in a dialogue and exist in a symbolic symbiosis with his paintings. How would you describe the mission of the Museum Montanelli? How do you see your museum’s future? I always see just the present, perhaps with a slight glance towards the future. We have to tip-toe lightly and be grateful for today – always with an eye to what is going on in the world. Modesty and humility are our constant guests. Creativity does not ask about the future. You are a doctor by profession. Is art a way of compensating for your rational training? It’s a fallacy to think that the medical profession is just rational. My compensation was always when the patient got better – that minor miracle. But I sense that there are far more art lovers among doctors than in any other profession. Perhaps doctors are better at realizing that art transcends our fragile physical existence and can give life a wealth of meaning. Recently, while viewing the exhibition Postwar in Munich, where 218 artists from 60 countries addressed the horrors of the Second World War, a work by Joseph Beuys immediately struck my eye. To its right hung a painting by Francis Bacon and across from it was one by Gerhard Richter. When I left several hours later, I was deeply affected and moved. That exhibition’s message, like other projects that present good art, was so strong that its effect is difficult to describe in words. Therein lies the power and mystery of art – and not just visual art. At least for me. Photo caption: Professor Dadja Altenburg-Kohl during preparations for the exhibition Between Asceticism and Ecstasy at the Museum Montanelli on Prague’s Neruda Street. 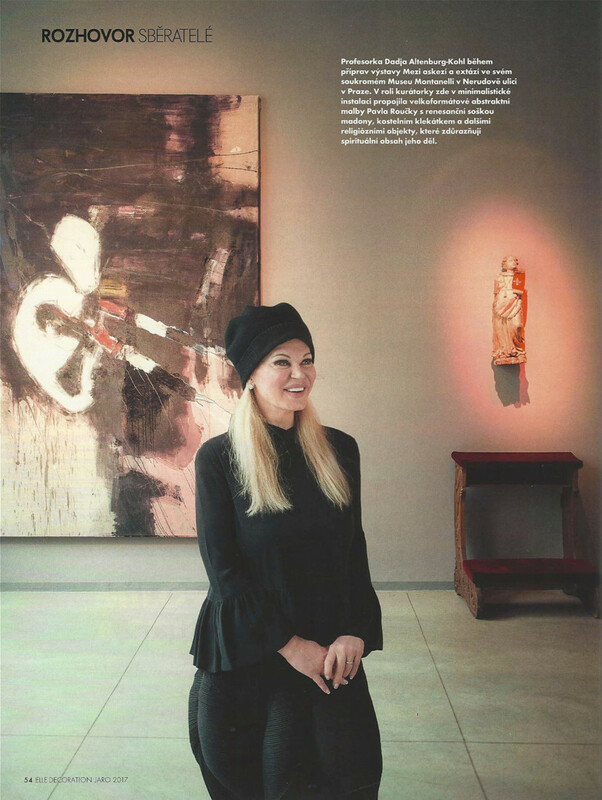 In her role as curator, she has created a minimalist exhibition combining Pavel Roučka’s large-format abstract paintings with a Renaissance statue of the Madonna, a prie-dieu, and other religious items emphasizing the spiritual nature of Roučka’s art.